Award winning creator and Marvel artist Arthur Suydam's meteoric rise to superstardom for his work for the smash hit series Marvel Zombies broke graphic novel records, immediately placing the artist in the category of comic legend. Arthur Suydam was recently honored with: the Spike TV Scream Award, (best writer, best artist, best comic of the year) Suydam's short story Christmas Carol was chosen for inclusion in The Mammoth Book of Horror and Legends for best comic horror stories of all time and The Art of Painted Comics (2008). Suydam was recently honored with the prestigious Spectrum Gold Award for Excellence in Illustration, the San Sebastian Film Festival Lifetime Achievement Award, a Lifetime Achievement Award from the University of Maryland Eastern Shore, and numerous fan-site favorite awards across the globe. Suydam's popular covers have graced the covers of Deadpool , Marvel Zombies, Dead Days, Marvel Zombies #2, Marvel Zombies#3, Batman, Wolverine, Fantastic Four, The Incredible Herc, X-men, Ghost Rider, Thor, Spider Girl, Black Panther, Oz Chronicles and more. In 2008 Marvel released an exclusive hard cover tribute to the works of this unique artist entitled Marvel Zombies, The Covers dedicated to Suydam's groundbreaking work. Additional recent works include, Dynamite's Army of Darkness, Savage Tales, Red Sonja and the smash hit Army of Darkness vs. Marvel Zombies and Raise the Dead. Past works include work on Batman vs. Predator, Conan the Barbarian, Tarzan and House of Secrets. Suydam's own projects are numerous and include Mudwogs and Mudwogs II, and The Adventures of Cholly & Flytrap, Center City, released through Radical Entertainment, The Day it Rained Eggs , Love Me, Love My Demon and many more. A life-long fan of Marvel comics, Suydam also branches out with select projects that include film noir for Hard Case Crime, where Suydam provides retro-inspired covers for such titles as Mickey Spillane's newly released Dead Street, Robert Bloch's Shooting Star and Fright by Cornell Woolrich Noir pulp great Mickey Spillane's final novel released this year Dead Street, The Tick, and more. Suydam's immense body of written and illustrative work comprises an aesthetic that is as uniquely distinguishable as it is organic and poetic. 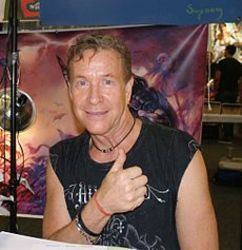 In addition to his own works, Suydam has contributed text and artwork to countless publications including the highly acclaimed re-release of the children's classics, Bre'r Rabbit and The Wind in the Willows. Preferring to grow and create on the less lucrative fringe away from commercial pressures, Suydam enjoys the ultimate artistic freedom- the autonomy to follow his own aesthetic- developing styles, characters and tales from personal experiences and limitless imagination, outside of the confines of mainstream corporate limits. A consummate artist, Suydam has used his time to quietly build a body of work that is truly second to none. As a world class musician Suydam has composed and performed numerous film soundtracks. A list of Suydam's band members reads like a whos-who list of Rock's legends including musicians from Bob Dylan, Paul Mc Cartney's wings, Steely Dan, Paul Simon group, Aretha Franklin, The Stones, Billy Joel and many more. Suydam's current group The Gotham Playboys recorded 3 albums and recently won a Grammy for The Sessions with Bruce Springsteen. An artist with diverse passions, Suydam has a rare ability to attune himself to the feel and flavor of any area of art, style, history and character. His settings are as beautiful and as haunting as his stories are tender and twisted. The techniques he has honed over the decades breathe a life and magnetism into his characters. Genius tempered with technique-herein lies the magic of Arthur Suydam. Suydam is a member of the Society of Illustrators and lives and works in Manhattan's East Village. He can often be found at conventions where he will annex artists' tables next to his and leave those artists to fend for themselves.